This article was originally written by Junichi Niino and published on Publickey in Japan. It has been translated with permission from the author. We maintain a balance between the performance and compactness of our components. Bannon:　The strength of Wijmo lies in almost 25 years of component development. 25 years ago, we developed and started providing a product named “FlexGrid,” which was a Visual Basic component. Afterwards, we supported FlexGrid in various technologies like .NET, Silverlight, WPF, JS, etc., and we developed various new components as well. Wijmo is one of these products. We maintain a balance between the performance and compactness of our components. Along the way, we've been continuously improving them to be flexible. We optimize the core controls to include only the most important features; and we offer extensions to provide custom features. Wijmo FlexGrid In addition, our enterprise customers appreciate our support, maintenance, and the fact that we strictly follow our release schedule. Lastly, high interoperability with a variety of frameworks is another strong point of Wijmo. Alex specializes in this and can elaborate on details. Ivanenko:　Wijmo supports AngularJS, Angular 2, Knockout.js, etc. This interoperability is something we always had in mind since starting Wijmo 5 development. Our customers greatly appreciate our user support and there have been many requests related to interoperability. Currently, we're looking into ReactJS support. 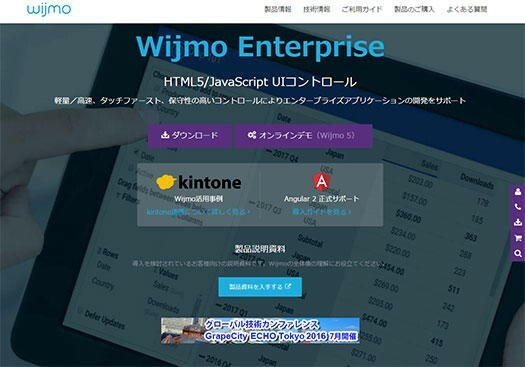 It's big news that Microsoft Dynamics CRM is using Wijmo. Can you tell how Microsoft became customers? Bannon: Microsoft approached us for using Wijmo in Dynamics CRM. 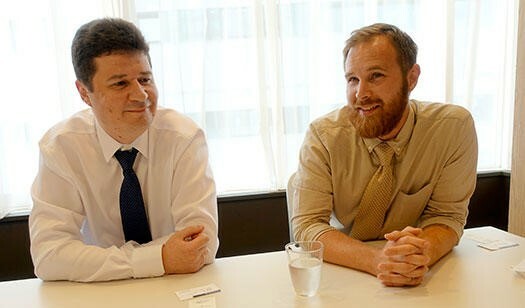 When we had our first discussion with them, they already had a deep knowledge of Wijmo. They had clearly done a lot of research. When asked about reason to use Wijmo, the main reason they mentioned was to add mobile support in Dynamics CRM. I believe they liked the fact that by using Wijmo components, they have the flexibility to customize, supporting a large number of mobile devices including touch support, and that it can also be implemented very easily. What kind of development tools and frameworks are you using in development of Wijmo? Bannon:　We're using Visual Studio as IDE, TypeScript as language, and LESS for CSS. We have automated unit testing using Selenium, and the code is automatically tested every night. At the time of release, it goes through manual QA testing once all the automated tests have passed. Chris, you talked about the importance of ECMAScript 5 while presenting Wijmo 5. Why is it important? Bannon:　In ECMAScript 3, there were some limitations related to the language, so it was difficult to provide true controls. In ECMAScript 5, the most important feature is that a user can operate property values against objects by directly using a “getter” and “setter”. This is a small thing, but it has a huge impact on our control API. Finally, a last question: “Wijmo” is a really unique name. Where did it come from? Bannon:　The name is a kind of pun. We took the phrase “widget + more” to represent “more than a widget," which becomes “widgetmore” and hence the name “Wijmo” (laugh). Niino: Thanks for your time today.